​The best elements of many styles together create a practical and accessible system of self defense. 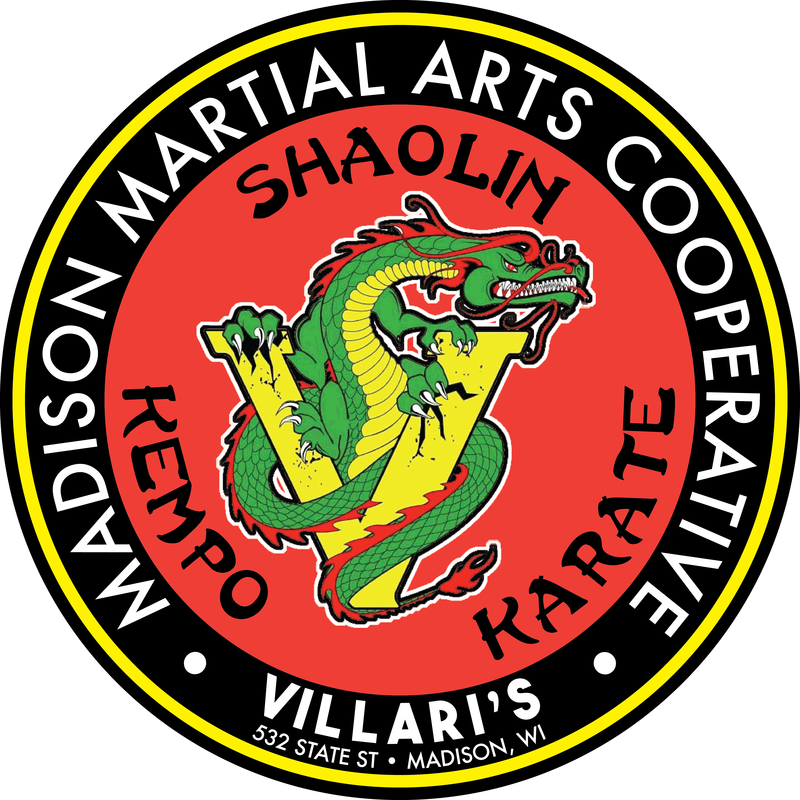 ​"Shaolin Kempo Karate" was founded by Grandmaster Frederick J. Villari. In the last four decades, his fighting system has become internationally recognized and respected. His art traces its origin back over a thousand years to the Shaolin Temple of China. Many of the basic methods are still used in his schools today. The present form has become famous because of its very effective "Four Ways of Fighting." Scroll down to learn more about the different influences in our style! PUNCHING - With your hands (punching, striking - open or closed hand) or use of any part of the arms, elbows, forearms, etc. KICKING - with foot, leg, knee, shin, etc. Grandmaster Fred Villari played a significant role in demystifying the prejudice that only a few select people should have the opportunity to learn martial arts, and showed thousands of Westerners of all ages and ability levels how to find their inner strength and power through his unique fighting style: Fred Villari's Shaolin Kempo Karate. His work contributed to a major turning point in the teaching of martial arts, directing it more toward practical fighting, and helping to make martial arts accessible on a massive scale. Grandmaster Villari continues to teach and demonstrate martial arts in his schools today. 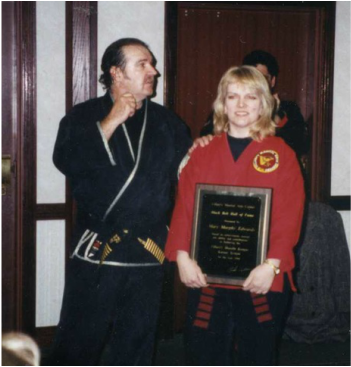 Master Mary Murphy (RIGHT), who founded our dojo in 1989, was inducted into the Black Belt Hall of Fame for the year 1999 by Grandmaster Villari (LEFT). Grandmaster Villari teaches that the ultimate in self defense does not lie in one way or style of fighting. By combining the most effective elements of several styles, we eliminate weaknesses and vulnerabilities. This is the central theory and method behind Villari's art of Shaolin Kempo Karate. Each martial art offers something to compliment the other. By combining circular fluidity of Shaolin with the linear, angular movements of Kempo and Karate, the end result is a system greater than the sum of its parts. In the realm of fighting, SHAOLIN is renowned for its devastating kicking and punching techniques. It incorporates the movements of five animals: TIGER, LEOPARD, CRANE, SNAKE, and DRAGON. The Shaolin theory of fighting is based on circular movements, speed, conditioning, and developing strong internal energy, tendons, and ligaments. Shaolin is the foundation of our style. This system is balanced, and connects mind, body and spirit. Grandmaster Villari also utilizes the art of KEMPO. It is a mixture of hard and soft movements that blend nicely, though it is not sophisticated enough by itself. Alone, kempo lacks the grace of Shaolin with its integrated leg maneuvers, the quick shuffles and footwork of Karate, and the explosion of hard Karate. The great Shaolin Temple in the Song Shan Mountains of central China was established around 495 A.D. It was built by the Chinese Emperor Hsiao Wen for an Indian monk named Batou, known by the Chinese as Fo Tuo. In this temple around 530 A.D., Bodhidharma, an Indian monk traveling from India, introduced a new Buddhist meditation method and fighting techniques to the monks. First, he introduced a form of breathing exercises based on animal movements to the temple monks, to strengthen and condition their bodies and purify their minds. Then he taught them how to use the movements of animals for self defense purposes. Over time, the monks changed and perfected these movements. This style became known and respected as the art of Shaolin Temple Boxing. Buddhism and Shaolin Temple Boxing or "Shaolin Ch'uan Fa" were the Shaolin Temple's main legacy to the world. So it was in China that the philosophical and religious system upon which many martial arts depend were first introduced and nurtured. In the 1600's, Japan conquered Okinawa and to prevent uprisings, restricted the people of Okinawa from using any weapons. The natives had no alternative but to practice the art known as "Te" or empty hand fighting. Te was derived from the Shaolin "Chuan" which had, by that time, spread throughout China, and had become popular, around 900 A.D, with the Chinese people of the T'ang Dynasty. Many Okinawans were secretly sent to China to learn the martial arts. They later returned and influenced the methods in use on Okinawa. Okinawans changed the name of their martial art from "Te" to "Karate". The term "Karate" means "T'ang hand" and is used to acknowledge the Chinese influence in the Okinawan's art. Karate was first demonstrated in Japan in 1917 where even more styles developed. Long before either the Chinese or the Okinawans practiced and developed their arts, the Tibetans and Mongolians had their own form of combat from which the venerable art of Chin Na, or the art of the White Tiger, was further developed - a devastating form of locking, seizing, holding and grappling. The Tibetans and the Mongols were masters of grappling. The art of Shaolin Kempo Karate was founded and developed by Grandmaster Villari after many years of studying and mastering numerous different styles of the martial arts including Shaolin Temple Boxing, Jiu Jitsu, Kung Fu, Kempo, different styles of Karate, as well as the secret art of the White Tiger (Chin Na). Grandmaster Villari's Shaolin Kempo Karate system also incorporates the venerable art of CHIN NA. It is the ultimate form of neutralizing an opponent, utilizing holding, seizing, locking, throwing, felling and delivering controlled pain. No other martial art gives such control over an attacker. Grandmaster Villari also teaches moves of the IMMORTAL MONKEY, known for its art of illusion. The Monkey cannot be hit. Its movements are lightning-quick with the ability to change its direction rapidly. It never exhausts its energy and has superior longevity. The monkey is always happy!